Happy New Year everyone, we hope you’re settling into the new term. As promised here is a post about flat roof maintenance. Whether you have a new roof or an old one, regular maintenance is essential to prolong its life and ensure that any problems don’t get out of hand. Flat roof maintenance – Why is it important? Flat roofs, by their nature, are easy to forget. Many of them don’t get seen in our day to day work, unlike furniture, floor coverings or windows. It isn’t hard for them to be out of sight, out of mind. However, if you want to keep your school warm and dry, there are a two major reasons why regular maintenance is essential. If your roof has a guarantee, it will have a required maintenance regime. If you cannot demonstrate that the maintenance required has been carried out, your guarantee will be invalidated. Keep a maintenance record so that you can demonstrate that regular maintenance has been carried out in accordance with the guarantee terms and the manufacturer’s advice. That way, if something does go wrong, you’ve done what is required and you’ll be protected. Not all damage is this visible! As your roof ages, and even if it doesn’t have a guarantee, carrying out regular maintenance will allow you to keep an eye on the condition of the roof, and identify any problems before they cause major damage. 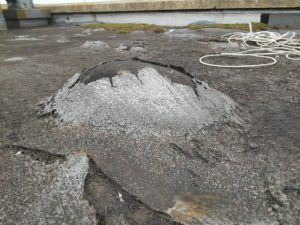 Small areas of damage to a flat roof could be fixed by patching or an “overlay” rather than a complete strip, which might be required if the roof is very damaged. An overlay will produce much less disruption to the school and if it can be done, is much more cost effective, as much less resource is required in terms of materials and labour. If you can spot a problem in time, considerable cost and disruption will be saved. Maintenance will allow you to keep the roof clear of debris. Leaves, silt, even tree branches can land on a roof and get swept into the gutters causing blockages and back up. This can result in additional costs clearing the rainwater pipework. In a school environment, it is also more likely that you’ll get footballs, tennis balls and other detritus ending up on the roof. If a leaf guard on a downpipe comes loose and one of these items gets stuck in the downpipe it can be difficult to clear, and cause backups and flooding. Much better to get this stuff off the roof regularly to avoid additional cost and disruption. In summary, you wouldn’t buy a brand-new car and not have it serviced – a flat roof is just the same. Being up on a roof is always risky, and flat roofs should be designed for maintenance, so that maintenance can be carried out safely and to minimize the risk of being on the roof. Nevertheless, going up on the roof isn’t a job for anyone who isn’t qualified or insured. 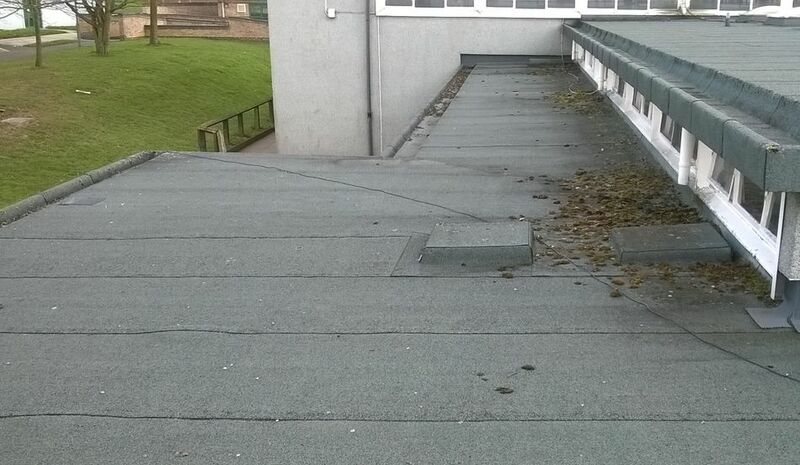 Your School Risk Assessment will identify that one of the obvious hazards is going up on the roof. A member of staff without proper training and qualifications should NEVER go on the roof. Instead, flat roof maintenance should always be carried out by a qualified and insured contractor. In normal circumstances, the contractor who installed your flat roofs would carry out a maintenance regime. If you don’t have a contractor carrying out regular roof maintenance get in touch and we would be happy to recommend one of our DATAC accredited contractors in your area. Better safe than sorry. How Often should you carry out Flat Roof Maintenance? Roof maintenance should be carried out twice yearly – once in the Autumn and once in the Spring. 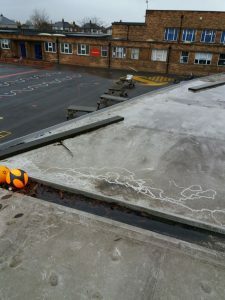 A flat roof, which has been designed and installed in accordance with the recommendations of this British Standard, can be expected to provide trouble-free service provided it is properly maintained. 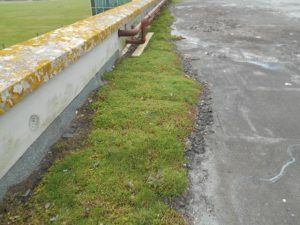 A flat roof should be routinely inspected every spring and autumn. The spring inspection may detect winter related roof damage. The autumn inspection should ensure that the roof is clear of leaves, debris, and dirt before the approach of winter. Roofs in high-risk locations, those in areas subject to high dust or pollution, or in close proximity to trees, should be inspected more frequently. Bird guano, trees and other conditions. The guide also provides advice on repairs, keeping a maintenance schedule, an inspection regime, cleaning and other advice. We highly recommend the client takes out maintenance with the same contractor as that which installed the roof. This maintains your obligations under the guarantee but even more importantly, ensures a long and fully functioning, trouble free life for your flat roofing system. If you have a question about flat roof maintenance do contact me I’ll be happy to help. Maintenance is an essential part of preserving the integrity of your flat roofing system. It is really important to watch out for ponding water (accumulative water that does not evaporate or disappear within 48 hours of conducive drying conditions) since it is the major cause of leaks on flat roofs. Kudos to you for posting this. Roof maintenance ensures that your home remains strong and is capable of withstanding harsh weather conditions over the rest of the year. That is why having your roof assessed is essential. Thank you for sharing this helpful blog.